Today was one of the most beautiful days for baseball since spring training. As Baseball Ross and I took our seats under the overhang in the shade, we were pleasantly surprised when we saw Adam Morgan take the mound. Morgan has been sidelined since last summer with a shoulder injury. He spent the better part of that year here in Clearwater rehabbing. He looked good, seemed to have good control and his velocity seemed to build with every inning. Considering it’s been almost a year since he’s pitched in a competitive setting, it was quite an impressive return. Here’s to hoping that next season will be his best yet. If you have been reading my blog, you know I’ve had a long summer dealing with pain and weakness in my right elbow. I’m ambidextrous, so I was able to deal with it fairly well, except when it came to using my camera, which is definitely made for right handers. I didn’t blog as much as I would have liked and two weeks ago, it hurt too badly for me to ignore any longer. Baseball Ross took me to the urgent care for help. The doctor there said I had, “tennis elbow and a bone growth that would need to be removed.” I panicked, who wants to have surgery?! Friday, I went to see the orthopedic surgeon, who happens to be the official surgeon of the Toronto Blue Jays and the Dunedin Blue Jays. Who better to see than the guy trusted with million dollar arms, right? He reviewed all the information and X-rays from the urgent care physician and declared that EVERYTHING he had told me was wrong. I do not have “tennis elbow” but “golfer’s elbow” a muscle issue with the inside of my elbow. I also have a pinched nerve, so keeping my arm bent in a sling as the urgent care doctor suggested was the worst thing I could have done. So what do I do? For starters, he gave me an air-cast brace that will support the muscles while they heal. I’m also to keep the elbow as straight as comfortable (even while sleeping) and he gave me new anti-inflammatory medicine that seems to be doing the trick. If this does not clear it up, then we can try cortisone shots to the elbow and finally as a last resort, he can move/reroute the nerve to the top of my elbow so it won’t be pinched. Surgery if it would happen, is a long way down the road, at least a few months. 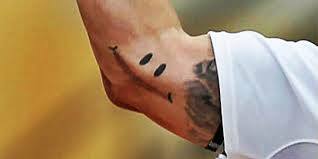 The only disappointment for me is that if I had to have elbow surgery I wanted to get my first tattoo…. I guess it’s worth going to one of the best “arm-guys” in the business if you want a good result. Baseball Doctors Rule! If you’ve been following my blog for any length of time, you’ll know that one of my favorite players has been Derrick Mitchell. I’ve followed Derrick since his days in Clearwater and feel lucky that I can call him a friend. 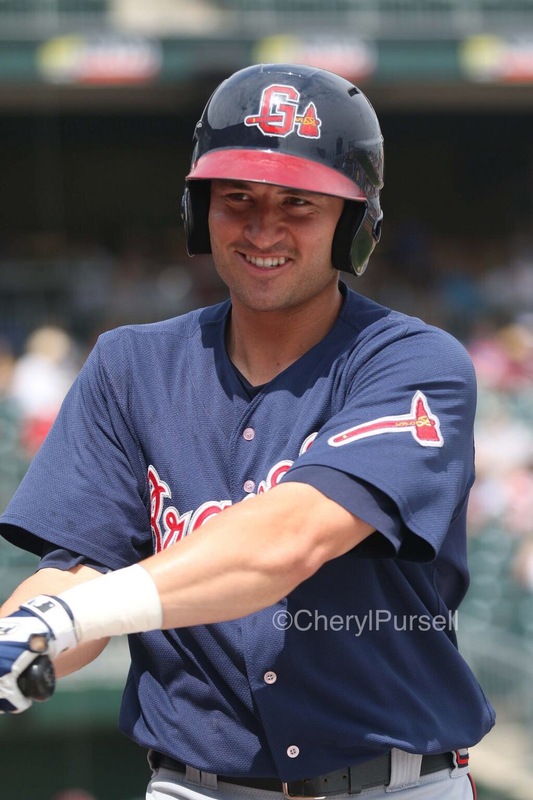 Even when he went to the Braves organization, Baseball Ross and I continued to follow him. Both of us, were shocked and saddened when he was released by the Braves organization in July. Reggie Jackson was in the house! Today is one of those days, one of those days I will remember the rest of my life. 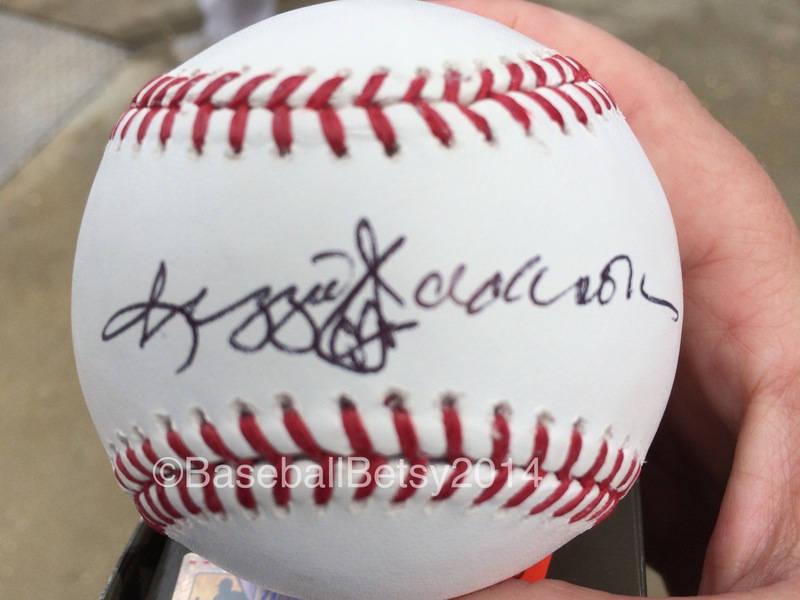 Today I met Hall of Famer, Reggie Jackson. 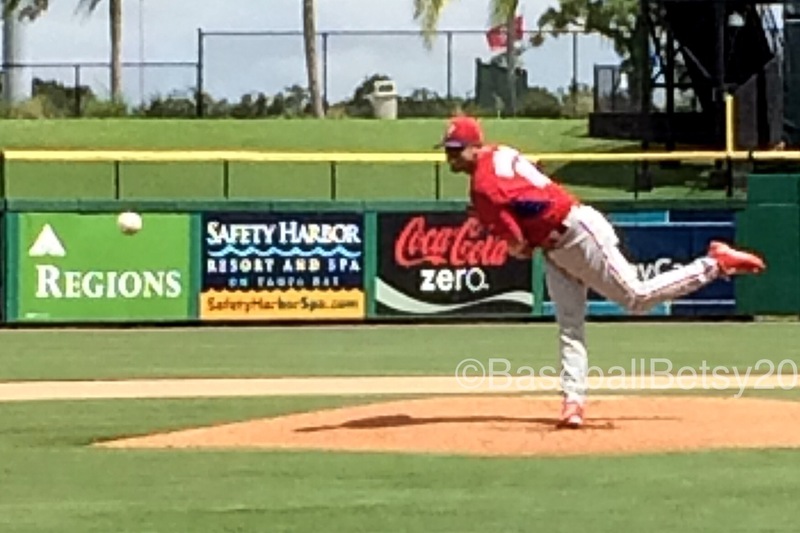 Today was the first day of the fall instructional league and the Phillies were playing the New York Yankees. I looked over and there was a gentleman wearing Yankees garb and it was Reggie Jackson, Mr. October himself! I waited for a moment when he wasn’t talking to anyone and kindly asked for his autograph he was happy to oblige. It’s one of those moments that you can never forget, meeting a Hall of Famer like that, especially when you were expecting to. I didn’t have a ball with me but luckily, my good friend Charlie had an extra. So now, I have the autograph of one of the greatest players of the game! As I’ve mentioned earlier in the summer I’ve been dealing with a bad case of “Tennis Elbow” that’s made my blogging and photography difficult and painful. I’ve done the best I could, but last week, it was too much. With a trip to urgent care, there was more, the discovery of a “bone growth” in the elbow where the nerves pass. A simple explanation for a painful condition. I talked to some friends and was recommended to a local practice. It was large and when I called, the appointment setter lined me up with their best “sports injury” guy. Turns out this sports blogger is going to be seeing the doctor for the Toronto Blue Jays and Dunedin Blue Jays. It’s like the lines have blurred. Better yet, he must be good if he can be trusted with million-dollar arms, he should do a wonderful job on my $1.98 arm, right? So cross your fingers and hopefully we will have a plan of action soon. I was born in Central Pennsylvania, I’m a Phillies fan at heart and always will be, but since we moved to Florida there’s been someone else. Well, may be I should say, someones else. 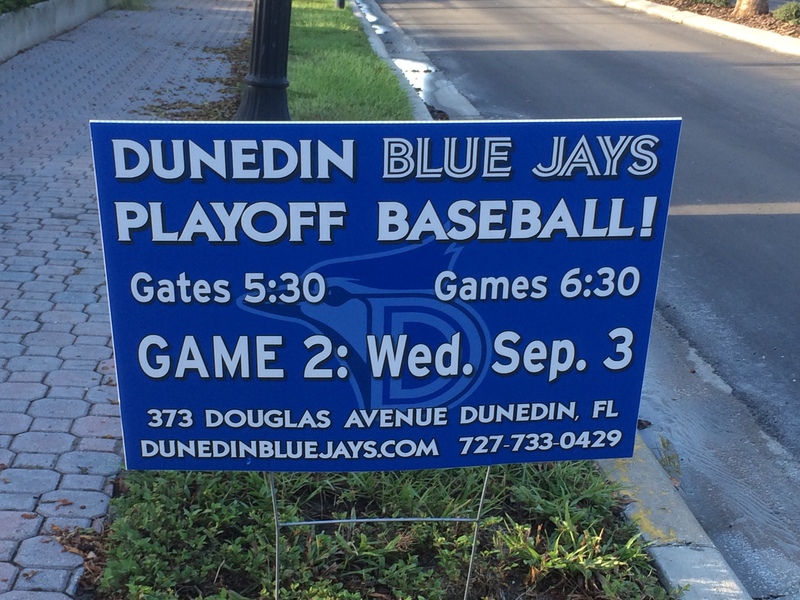 You see, I live three blocks from the Dunedin Blue Jays’ stadium. At first, I went there just when the Phillies or Threshers were there, like you’d expect, but the more I went, the more I was hooked. You see, there is something different about Dunedin, you feel like you belong. Go to a few games and they get to know you. There’s a smile as you walk through the gates, a wave from the ladies at the concession stand (even if you don’t need anything) and a real sense of community. It doesn’t feel like a big corporation, it feels like a team that belongs to the town, you feel like you’re part of something. Every game a local charity holds their 50/50 drawing, there’s a toy drive for the local children’s Christmas charity, there’s the annual charity bowling tournament, sponsorship of little league teams, you name it, the Blue Jays are there for the community.